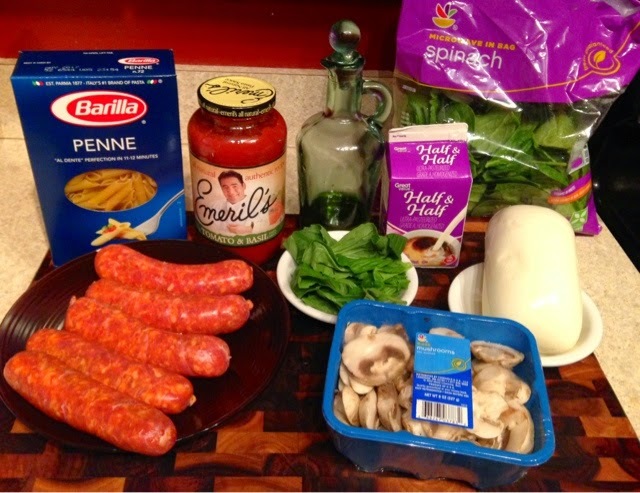 Bacon is my favorite meat, but Italian Sausage comes in as a close second. On our Sunday Costco trip, Josh and I bought 20 links of Italian Sausage. That is a lot of pork, but I knew I had the perfect way to use up a portion of that meat. 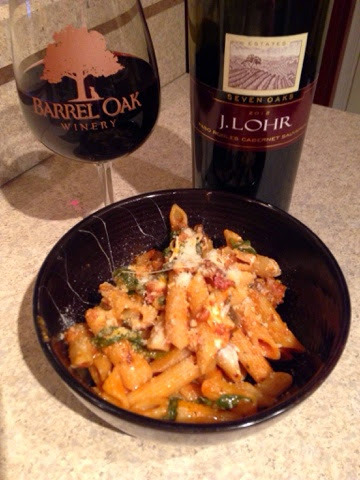 A cheesy, creamy and delicious pasta that is perfect on a cold night with a glass of wine. While it wasn't cold, we did have wine and I forgot how great this dish is. 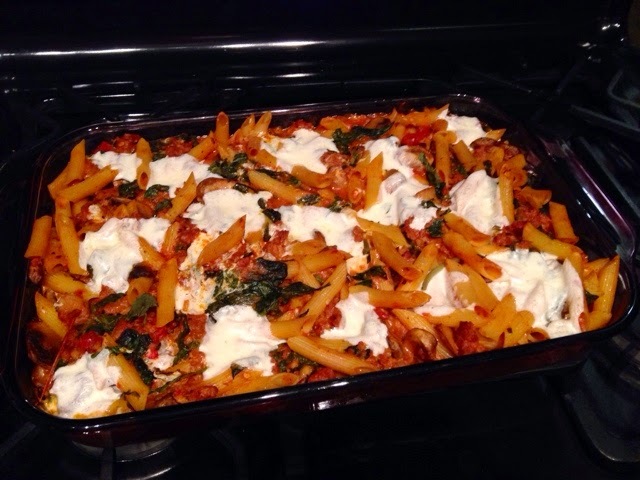 This base of this pasta is adapted from a recipe by How Sweet Eats, my favorite food blog. While her pictures are much prettier, I think my version is tastier. I give all of the credit to the sausage. Some other changes I made: add more cheese (always a good idea), add more more sauce, cut the cherry tomatoes and replaced them with a bag of spinach and container of mushrooms. This is an easy, weeknight meal that will make your mouth water. 2. 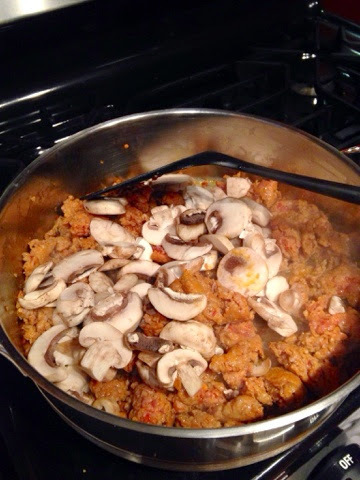 Once the meat is completely brown and the mushrooms have a golden color, add the entire jar of sauce. 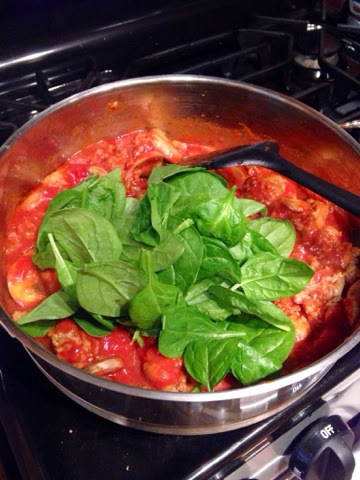 After about 5 minutes or until the sauce is hot, gradually begin adding your bag of spinach. It will seem like too much at first. Work in thirds. 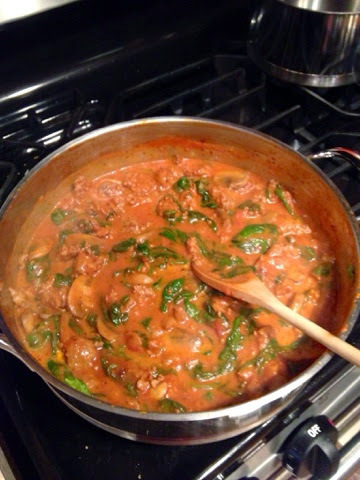 The spinach will reduce in size greatly as it is incorporated into the sauce. 3. After you have wilted all of the spinach, add the Parmesan and the half and half. See how much the spinach cooks down! That is an entire bag of spinach in that skillet. 4. Once they are completely incorporated into the sauce add the pasta. 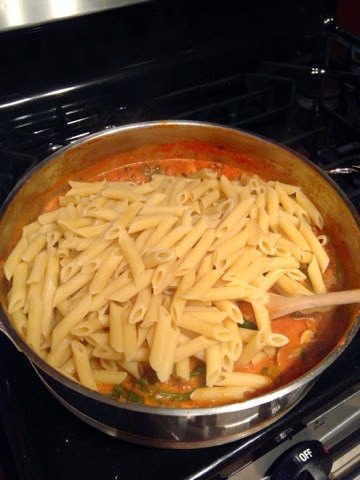 Coat all of the pasta with sauce. 5. Add three-quarters of the mozzarella and basil. Stir to evenly distribute. 6. Pour the contents of the skillet into a large baking dish. 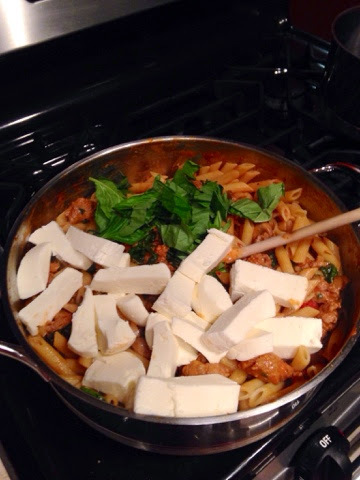 Top pasta with remaining cheese and basil. Place in oven and bake for 25 minutes. 7. After baking, remove from oven and let sit for 5 minutes. My pictures do not do this dish justice. But, once you put that first bite in your mouth you will see what I have been talking about. It is cheesy, filling and delicious. Try it out soon and your taste buds will be thrilled. Hey! Yummy post! 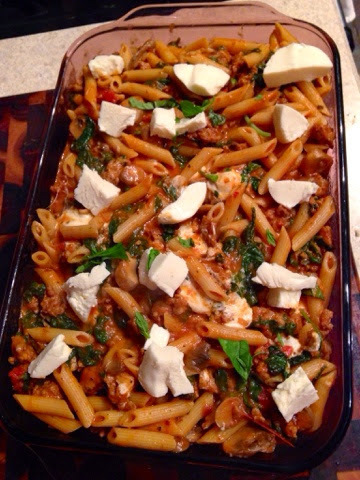 What do you think about adding san marzano tomatoes, diced garlic and/or red wine to the sauce to doctor it up? That sounds awesome! I will try it out the next time. This is 100 percent a recipe that you can add a little something/change it up to make something even more delicious!